Audio of daily prayer read by Fr. Madigan, O.M.I. Opening Prayer: Father, may we share in the light of Your glory through Your Son, the Light of the world. Amen. Meditation: What do I need to resurrect in my life to better serve God? Closing Prayer: Father, grant me comfort in knowing that I will be reunited one day with my loved ones in Heaven. Amen. 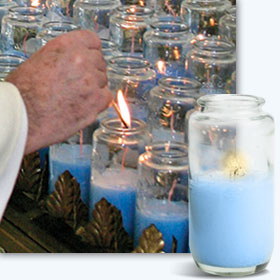 When a Votive Candle is lit, the flame and smoke represent prayers being lifted up to Heaven. This wonderful devotion has been part of our faith for centuries. At the National Shrine of Our Lady of the Snows, Votive Candles are lit for persons in need of healing. You can have a loved one lifted up in prayer while also supporting Oblate ministries with people in need. Opening Prayer: Lord, give me the grace to repent of my sins, to do penance and to amend my life. Amen. Meditation: Today I will thank Jesus for making the ultimate sacrifice for me. Closing Prayer: Almighty God, may we be united with You and Your people in the meal we hope to share in Your eternal Kingdom. Amen. Opening Prayer: Father, help me be a faithful witness to the salvation Christ won for me and all humanity. Amen. Meditation: Who among us is in need of my prayers? Closing Prayer: Father, may I never lose faith in Your power to see me through any difficulties. Amen.